That said, “She Loves You” seems to have been a genuine 50-50, half & half, collaborative effort. At the time they composed it, the boys were on a bus tour as a back-up act to a teenage girl named Helen Shapiro. The song itself is unusual for a love song, in that it is about a guy talking to another guy about a girl who loves the second guy. Another gimmick of John and Paul’s was the constant use of pronouns in their early song titles. “She Loves You” followed “Love Me Do,” “Please Please Me,” and “From Me to You” in the Beatles canon. Another pronoun title, “I Want to Hold Your Hand,” had actually preceded “She Loves You” to the top of the charts in America, and these two would be back-to-back number one hits for the Fab Four in early 1964. This rare event had only previously been accomplished by Elvis Presley in 1956. Americans at large got their first earful of “She Loves You” (and eyeful of the Beatles themselves) on a film clip of the Fab Four on “The Jack Paar Show” on January 3, 1964, one month before the Beatles arrived in the U.S. for the first time. Paar showed the brief clip and made a few withering, sarcastic remarks as the studio audience giggled at these strange-looking long-haired youths in their matching collarless jackets. Despite this being the first widespread look at “She Loves You,” it was not the first time Americans had been exposed to it. 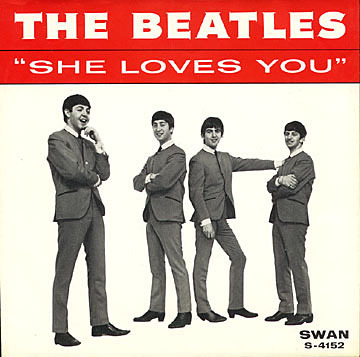 “She Loves You” was released a few times on various minor labels in the U.S. in 1963… It flopped. Famed DJ Murray the K even played it to lukewarm reception with it placing third of five new singles he debuted that week. For whatever reason, although the Beatles were already a smash act in England, the record buyers of America answered the early Beatles efforts with a yawn of disinterest. Of course, this would rapidly change. In any event, it turns out the head shaking worked and the bit by George and Paul drove the girls into a complete frenzy, as all four would do for the rest of their time together. And the rest, as they say, is history.